Henderson swimming pool cleaning service bucket test guide. 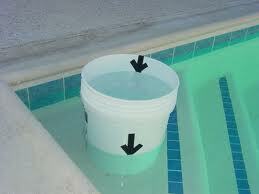 A simple and affective way to determined if your pool has a leak is to do a process called the bucket test. Below are the basics of the bucket test process. 1) Bring your pool water to the correct normal level. Then you’ll need a 5 gallon bucket and fill the bucket up to about 5″ from the top of the bucket. 2) Put the bucket on the first or second step of the swimming pool ensuring that it’s at least 5″ immersed into the pool water. 3) Use tape or a marker pen to mark the water level inside the bucket. 4) Mark the water level on the outside of the bucket using tape or a marker pen. 6) Wait 24 hours then compare the two water levels. If the level outside the bucket has gone down more than the level inside the bucket then it’s possible that you have a leak within the pool or equipment. If the levels are the same then it’s likely to be just evaporation. A quarter of an inch a day is normal from evaporation depending on temperature and other weather conditions. Only perform this test when it’s not raining. Feel free to call or email PoolStar the Henderson swimming pool cleaning service with any pool related questions as we are happy to help. This entry was tagged Swimming pool leak bucket test. Bookmark the permalink.